All buildings in Whale Cove receive water and sewage service by truck. Daily, trucks will visit homes, businesses, and public buildings and deliver water and pump out sewage waste. Water comes from a local lake, and is mildly treated before being delivered. Sewage removed from tanks, usually located under homes or buildings, is deposited in a lagoon located a kilometre from town. Garbage is also picked up regularly from all community establishments. Water and Sewage services are heavily subsidized as the costs can be difficult to manage. Whale Cove offers many modern facilities including Inuglak School that accommodates approximately 120 students from Kindergarten to grade 12. You can also find an RCMP detachment, municipal office, community hall, cooperative store, hotel, and a local radio station. The Whale Cove airport is located 8 kilometers from town. 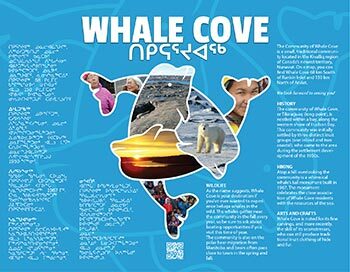 Whale Cove can only be accessed by plane, boat, or snowmobile. Visitors can fly from Winnipeg to Whale Cove on Calm Air. Flights to and from North and South arrive and depart daily Monday to Sunday, weather depending.